How could I forget this fun make? I followed Ashlee Marie's crochet striped beanie and bobble beard patterns. Made for a friend's little one's sixth birthday in a teen size beanie with a medium beard. 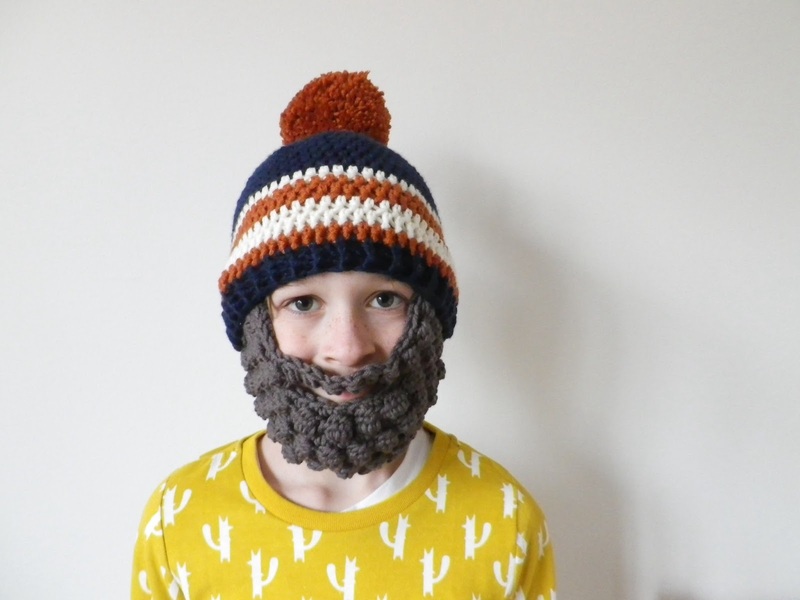 I first made Patch and his Daddy matching bearded hats last year (see here) and then for Reuben and Casper's birthday presents - which remain photo-less as they were finished and swiftly wrapped one eve before my parents were off to the Netherlands. I realised during the first two hats that they are slightly small and certainly are rather shallow. Is that what I mean? They seem to finish quite a way above the ear - which I find not so snuggly for a hat. I suppose the addition of a beard makes this not such a problem, but I still like a hat to be able to cover an ear or two. So for this one I added more rows, oh and attached the beard with buttons sewn onto the inside rib of the hat in case the wearer wishes to go beardless. Continuing with my nice-pattern-can-I-use-Drops-wool theme (the price, the washability, the softness - yum) this hat was made with Drops Big Merino in navy blue, orange and off white with mocha for the beard. Hope you had a happy birthday, Logan!